A look at the fascinating world of ants-the variety of “cities” they build, the job each ant carries out, and the remarkable things they can accomplish. If people were as strong as ants, we could each lift something as heavy as a car! 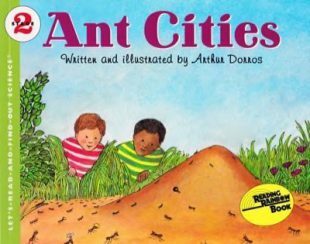 This popular Let’s-Read-and-Find-Out Science book explores the intriguing and complex ways in which these busy insects work together to keep their ant cities alive. Like many kids, I watched ants carry grasshoppers or other insects many times their size back to their hills. I poked at ant hills and watched the scurrying escapees. Ants were at the same time fascinating and pests. My relationship with ants changed over the years, as have other relationships. The book ANT CITIES is dedicated to one of my grandmothers. Her main interactions with ants were to step on them, set out traps for them in the kitchen and pour boiling water on them through cracks in the sidewalk. I don’t mean my grandmother was a generally cruel person-she was otherwise one of the kindest people I know. The understanding and attitudes each of us had about ants changed, at least in part, through my doing this book. I had told her my next book would be dedicated to her and this was it, so with my grandmother’s interest in ants, that seemed somehow appropriate. She never again poured hot water over ant colonies, at least not in front of me. I learned more about ants as I read every book I could find for research in the Brooklyn (where I was living at the time) Library. I found out that there is an incredible amount one could know about these intriguing tiny social creatures. And I found, surrounded by piles of books about ants, that there were about as many scientific opinions about the “facts” of ant life as there were experts in the field. I wrote letters to experts on ants and called with questions. I discovered that science is not a set of facts agreed on by all scientists. On any given matter, different scientists may have different opinions of what the “facts” are, and I would have to sort them out before I could decide which to present in my books. In researching how ants communicate, I called one of the foremost ant researchers. At that time she was with the Harvard Museum of Comparative Zoology. She was, as have been most people I contact to find out more about their fields, glad to share what she knew. Several days later I unexpectedly received in the mail a small box addressed to “Doctor Dorros.” Inside the box were ants. I had suddenly become a doctor of ants. I had to tell her I was not an ant doctor nor any kind of doctor for that matter, (though some of my relatives are). I got to know more about the ants that she sent me as those harvester ants, hitherto unknown in Brooklyn, soon escaped and were running around my apartment. Whether in the city or the country there are ants-they can make their homes in hollowed out tree branches or in miles of tunnels underground. A flying ball of ants dropped from the sky, or at least the second story of a house, into a neighbor’s yard not long ago-there are amazing ants almost everywhere.